At first glance cranes and herons may appear to be related. Sizable wading birds with long legs and long necks, their differences go further than just skin -- or feather -- deep. In addition to belonging to two different scientific families, they don't see eye-to-eye in terms of diet and social behaviors. Cranes belong to the family Gruidae, which has 15 species worldwide and only two native to North America -- the whooping crane and the sandhill crane. Herons belong to the family Ardeidae. There are many varieties of herons in North America, including the great blue heron, a color phase of the great blue called the great white heron, the little blue heron, green heron, black-crowned night heron and yellow-crowned night heron. An extremely rare bird, there are only 220 documented whooping cranes living in the wild today, and roughly the same number living in captivity. Wild whooping cranes are habitat specific, living in the marshes of Canada's Wood Buffalo National Park during the summer, and wintering in Texas' Aransas National Wildlife Refuge on the Gulf Coast. Another small captive-bred population summers in Wisconsin and winters on the Kissimmee Prairie in Florida. Young cranes are led on their first migration by ultralight aircraft. Great blue herons are found throughout the United States, Mexico and most of Canada. Great white herons are only found in south Florida, mostly in the Florida Keys. Other heron species are too small to be confused with cranes. The whooping crane is the largest bird in North America, measuring 52 inches tall, with a wing span of up to nearly 7 feet. The sandhill crane also has a 7-foot wing span. Great blue herons stand up to 46 inches tall, with a wing span of up to 6 feet. 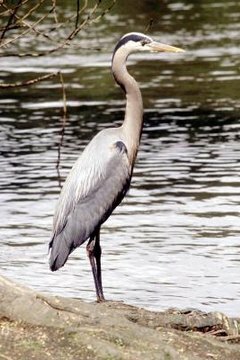 Other heron species stand up to 25 inches tall. In flight, cranes and herons can be differentiated simply by carriage of the head. Herons have heads, beaks and necks that weigh proportionately more than their bodies, so they must curl the head back and rest it on their body while in flight, giving it an "S" shape. Cranes, with smaller and sleeker heads, fly with their necks outstretched. Cranes have sharp, snappy movements with their wings and will raise them above their bodies in flight, while the heron has very slow wing beats and rarely brings them above parallel. The whooping crane is white with a black face, black legs and a thinner, darker bill than a heron. The sandhill crane might appear similar to a great blue heron from a distance, but he has white cheeks, a vivid red cap, a shorter neck, heavier body and a shorter, black bill. The great white heron has the same S-shaped neck and longer beak that the great blue possesses. Very social creatures, cranes tend to flock together in wide open spaces, with little to no use for trees. Herons prefer a solitary life, most often hunting and flying alone. Some species of herons are so solitary they will attack other herons on sight. Herons will perch and nest in trees as well as marshes, sloughs, riverbanks, grasslands, fields and even backyard ponds. What Kind of Birds Live in the Jungle? What Are the Different Types of Hummingbirds? What Is the Meaning of Crows Circling? What Is the Difference Between an Oriole & a Robin? What Birds Have Long Beaks & Long Legs?